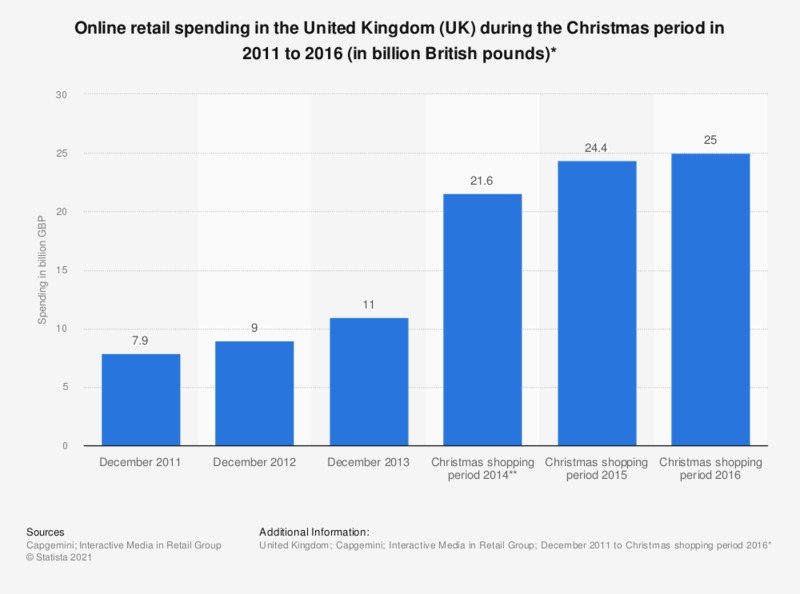 This statistic displays the amount British consumers spent on online retail during the Christmas period in 2011 to 2016. In 2016, online Christmas spending amounted to approximately 25 billion British pounds. * Data for 2011-2013 published earlier by IMRG covers only December. - 2014: "The Christmas shopping period as a whole, defined as the eight weeks between 2nd November and 27th December." - 2015: "The Christmas shopping period as a whole, defined as the eight weeks between 1st November and 26th December." - 2016: "The Christmas period, which is defined as running from 13th November to 24th December 2016."